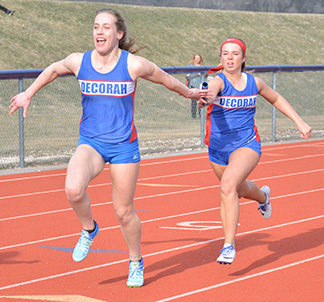 It was a picture-perfect night for track Friday as the Decorah girls track team hosted the first of two home meets. The Vikings welcomed eight other squads, including South Winn and Turkey Valley. In the team race, Decorah took care of business, winning with 137 points. South Winn collected 35 points, good for seventh, while Turkey Valley took eighth with 31 points. Decorah had four events win gold. In the 100-meter dash, Fiona Buresh won gold in 12.48 seconds. Brooke Berns blazed around the oval in 1:01.76, to cross the finish line first in the 400-meter dash. In the 4x100, Grace Syverson, Cassie Wyatt, Rose Gullekson and Brielle Buresh broke the tape in 52.33. The quartet of Katherine Bruening, Jordyn Hussain, Kaitlyn Schnitzler and Avery Shelton had a time of 1:00.84, good for first in the 4x100 weightmen race. Eight events also took silver for the Vikings. Two field events finished with runner-up finishes including Ambria Pipho in the high jump, clearing 4 feet, 10 inches and Hussain in the discus with a throw of 109 feet, 2 inches. Individual silver medals were earned by Berns in the 100-meter dash in 12.88 and Gullekson stopped the clock second in the 200-meter dash in 26.73. G. Syverson maneuvered over the 100-meter hurdles race in 16.96 for second place. In a longer, 1500-meter race, Leila Johnson traveled around the track in 5:18.64, good for second. Two relays also finished second, including the 4x800 and sprint medley. “We are continuing to make adjustments and take advantage of each opportunity given to us,” said Decorah co-head coach Cristy Nimrod. The Lady Warriors had two champion relays crowned during the night. Producing a time of 1:52.92 was the 4x200 relay of Eryn Sabelka, Shira Hageman, Ellie Loesch and Ashley Kriener. At the end of the night, the same quartet notched its second gold in the 4x400 in a time of 4:19.57. Loesch produced a bronze in the 100-meter dash in 12.90 seconds. Turkey Valley had two events crowned champions. In the 800-meter run, Jalyssa Blazek broke the tape in 2:30.68. Kara Reicks, Kylie Wurzer, Kourtney Schmidt and Blazek won gold in the distance medley in 4:40.04. Blazek added a silver medal to her evening in the 3000-meter run, producing a time of 11:45.21. Decorah will return to the oval at Hudson tonight, Tuesday, April 9, at 4:30 p.m. and will host an invitational Thursday, April 11, at 5 p.m. The Lady Warriors will be at Waukon tonight, Tuesday, April 9, at 4:30 p.m. and will take part in the Vikings invite Thursday to finish off the week. Turkey Valley will have two meets this week, one at Nashua-Plainfield, Tuesday, April 9, at 4:30 p.m. and the other at New Hampton Thursday, April 11, at 5 p.m.